Hey What About the Kayaking???? J/K Sounds like you found a gem in that river. 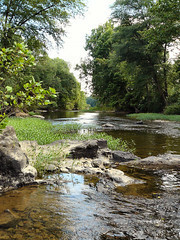 As the summer heats up I'll be hunting a nice cool stream to cool off in. Sounds like an awesome place to visit! Thanks for the bug repellent advice on my blog I appreciate you stopping by, I will check it out. hey, what camera did you use? those pictures are perfect/stellar incredable detail. Thanks for checking out my kayaking photos! I use a Panasonic DMC-FZ8 camera and I process the pictures through Picasa to straighten the horizons. I just wanted to let you know that the cabin you're talking about is my aunt and uncle's cabin and I'm SOOOOOOOOOO happy you had a good time. It's an AMAZING cabin and they're AMAZING people. I loved how much you liked the place and I'm definitely showing my aunt and uncle the comments you made. I'm sure it will make their day. Thanks for stopping by, Kacey!